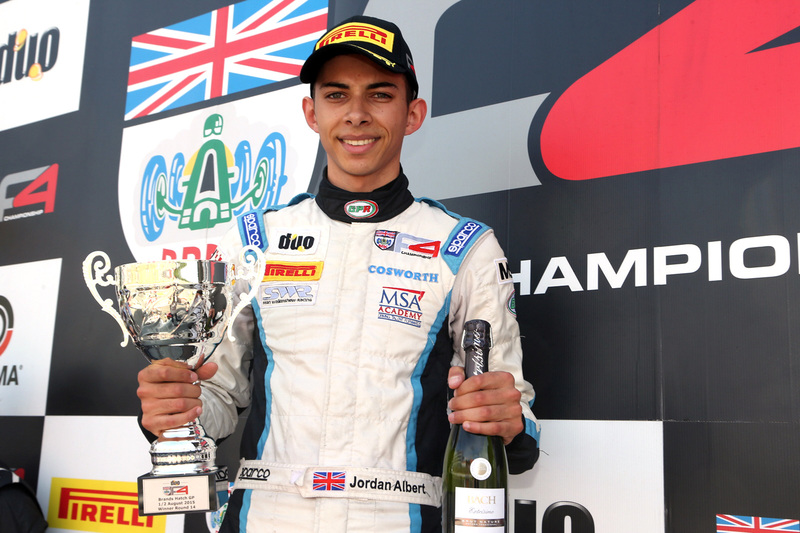 Pictured Jordan Albert raced to his second victory of the 2015 Duo BRDC Formula 4 Championship season. 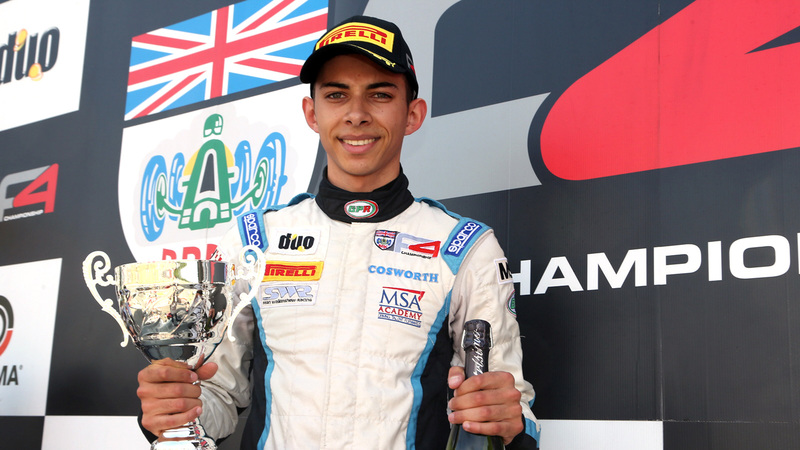 Jordan Albert raced to his second victory of the 2015 Duo BRDC Formula 4 Championship season. Series front-runner Jordan Albert raced to his second victory of the 2015 Duo BRDC Formula 4 Championship season at Brands Hatch Grand Prix Circuit on Sunday, 2nd August, to help keep his and the SWR team’s title hopes alive with nine races remaining in the current campaign. Adding to the excellent win he claimed during the first event of the season at Oulton Park in April, the rapid 18-year-old made the most of his front row start in race two of the weekend, round 14, to earn a richly deserved return to the top step of the BRDC F4 podium for the Chipping Norton squad. With pole-starter Chris Mealin clearly jumping the start, maintaining second position on the road during the early laps was Albert’s primary objective. When race officials served Mealin with a 10 second time penalty several laps into the contest, the win was there for the taking and the SWR driver duly delivered. Although very quick in pre-event testing, qualifying didn’t go according to plan and Albert had to start round 13 on Saturday, 1st August, from eighth on the grid. Swiftly moving into seventh place, the race was then brought under caution after an opening lap two-car tangle which resulted in a Safety Car period to lap five. At the resumption, Albert pressured Omar Ismail as he sought a way into the top six but spent the remainder of the 12 lap contest staring at the gearbox of his rival’s car. With Ismail, in turn, tight behind Jack Lang, the trio ran very closely to the finish but with no change of position. In SWR’s second car, Zubair Hoque lined-up 16th on the grid for race one – his first competitive run on the full Brands Hatch GP track – and he managed to climb into 14th place before the Safety Car appeared. At the end of lap six, though, Hoque had to visit the pits with slight damage to his front wing and after rejoining a lap down he ended the contest back where he started in 16th position. Aiming for silverware from the outset in round 14 on Sunday from second on the grid, Albert made a good clean start to maintain position but before the race got into its stride the Safety Car was deployed due to an incident at Paddock Hill Bend. Racing resumed on lap four and second place soon became the lead for the SWR racer when pole starter Mealin was given his time penalty. Although continuing to run second on the road, Albert had victory well within in his sights and delivered a very well-judged performance with pressure, at points, from Ismail and, latterly, Harri Newey. He took the flag on lap 13 just under a second clear. Hoque held 16th place off the initial start and following the Safety Car period he maintained his placing until lap six when he passed James Reveler for 15th position. 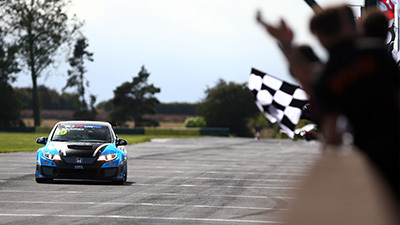 With a large gap to make-up to the next car, any further gains looked unlikely but on the final lap at Paddock Hill Bend a two-car tangle enabled Hoque to climb into 13th place. 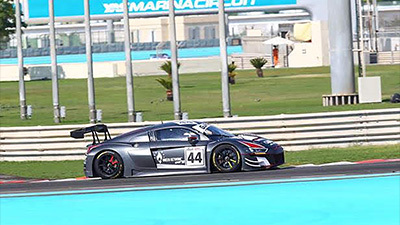 The live televised third race, round 15, was a largely uneventful affair for the SWR duo with Albert ending the contest in ninth and Hoque in 15th position. Starting the race in ninth place, Albert was edged back to 10th at Graham Hill Bend on lap one but he moved back into ninth at mid-distance when Newey ran off the circuit at Druids. Lining-up 14th on the grid, Hoque gained one position on the first lap and then moved into the top 12 on corrected times on lap five after Ameya Vaidyanathan was served with a 10 second time penalty. During the second half of the contest, though, the Cheshire racer was edged back to 15th. Reflecting on the weekend, SWR team owner Sean Walkinshaw said: “We’re obviously delighted with our second win of the season, Jordan did a great job and the result has definitely boosted his confidence. Testing went well on Friday, so it was disappointing qualifying didn’t work out, but overall it’s not been too bad for the championship – it could still go anywhere with nine races left. Rounds 16, 17 and 18 of the Duo BRDC F4 Championship season will take place at Snetterton 300 Circuit in Norfolk over the weekend 22nd/23rd August.